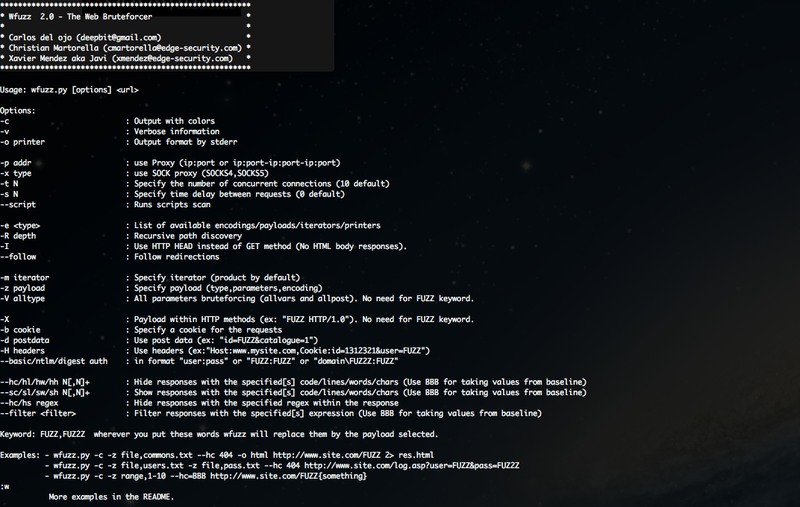 A Tool for Brute forcing / Fuzzing Web Applications . It ́s a web application brute forcer, that allows you to perform complex brute force attacks in different web application parts as parameters, authentication, forms, directories / files, headers files, etc. It has complete set of features, payloads and encodings. It can also be used for finding resources that are not publically linked such as directories & files, it can brute force HEADERS, GET and POST parameters for checking different kind of injections (SQL, XSS, LDAP,etc), it can also brute force forms parameters (User/Password) and carry out general Fuzzing,etc. • Hide results by return code, word numbers, line numbers, etc. • Dictionaries tailored for known applications (Weblogic, Iplanet, Tomcat, Domino, Oracle 9i, Vignette, Coldfusion and many more).